Kochi has been the harbour that received mariners from all over the world. In fact, sailors from China, Portugal, Arabia, Britain, and Holland set their foot on Indian soil in Kochi, which contributed in one or the other in shaping what Kochi is today. St. Francis Church: Built in 1503, this Anglican Church is an exemplary evidence of the European colonial struggle in India. The church contains the tombstone of Vasco-da-Gama and it has been the architectural model for numerous churches in India. Dutch Palace: This palace is a unique blend of the oriental and the occidental architectural patterns. It is famous for the mural paintings in it. There are three temples inside the palace, devoted to Lord Krishna, Lord Shiva, and Pazhayannur Bhagavati- the protective deity of the royal family of Kochi. 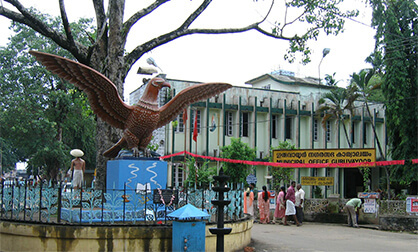 Pareekshith Thampuran Museum: Hill Museum is an important part of sightseeing in Kochi and Pareekshith Thampuran Museum is a part of this hill museum. This archaeological museum is situated inside the Hill Museum and is more popularly known as the Durbar Hall in Kochi. It covers a large area and is a busy tourist spot in Kochi. But apart from that, the museum has historical and archaeological significance as well. Pallipuram Fort: Pallipuram Fort was erected by the Portuguese in 1503, making it one of the oldest European forts of India which houses a rich cultural heritage. It is situated in the extreme northern part of the Vypeen Islands and heralds a glorious past within the territory of Kochi. Santa Cruz Basilica: The name Santa Cruz Basilica bears a special significance for the Christians residing in the south-western peninsular city of Kochi, as it celebrated the dawn of Christianity in the enigmatic land of India. Legend has it that the Santa Cruz Basilica has been stoutly standing its ground for a mammoth 500 years, which is a spectacular feat in itself. Although the Santa Cruz Basilica suffered ugly bruises from British invaders in the year 1795, it still continues to dazzle the on-lookers with its indelible charm and unparallelled charisma. Bolgatty Island: Bolgatty Island of Kochi is a small island, which is just a boat ride away from Kochi harbour mouth. 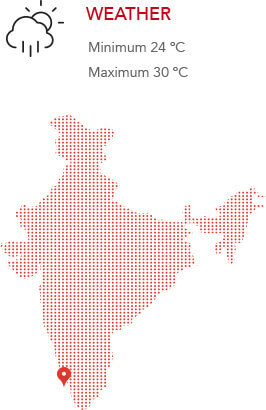 The small journey amidst the cool breeze is very interesting. Gundu Island: Gundu Island of Kochi is accessible through boat only from the Vypeen Island, which is situated nearby. The serene nature and the cool breeze blowing across the waters makes this island a favourite among tourists, who visit it for picnics or small excursions. 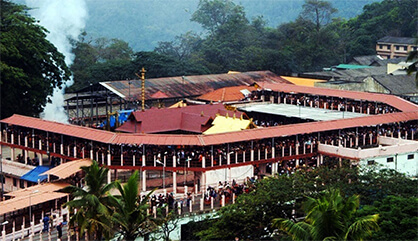 Sabarimala is a famous hill shrine located 72 km from Pathanamthitta town, 191 km from Thiruvananthapuram and 210 km from Kochi. Being one of the most famous pilgrim centres in India, it is situated on the mountain ranges of the Western Ghats at an altitude of 914 metres above the sea level and is accessible only by foot from Pamba (4 km). The temple is dedicated to Sree Ayyappa. Munnar is breathtakingly beautiful - a haven of peace and tranquillity - the idyllic tourist destination in God's own country. 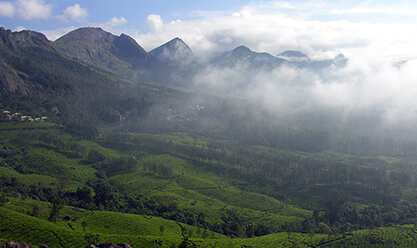 Set at an altitude of 6000 feet in Idukki district, Munnar was the favoured summer resort of the erstwhile British rulers in the colonial days. Kumarakom is considered to be a paradise on Earth. 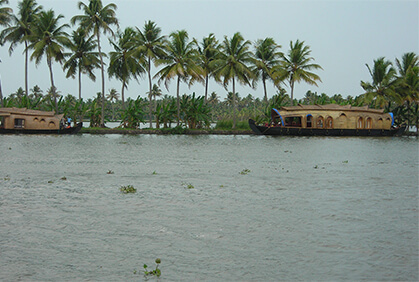 It is counted among the must-see places of Kerala and is a backwater hub. You will find lush green mangrove forests and coconut palms beside the shimmering backwaters, blue sky, and the migratory birds enjoying the moderate climate. The very sound of the word Thekkady conjures up images of elephants, never-ending chains of hills, and spice-scented plantations. In the Periyar forest of Thekkady is one of the finest wildlife reserves of India, which spreads across the entire district of picturesque plantations and hill towns that hold great opportunities for treks and mountain walks. 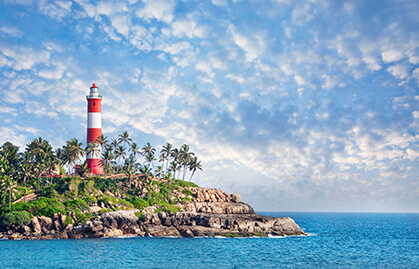 Kovalam is located 16 km from Thiruvananthapuram city, the capital of Kerala. This shallow beach with three adjacent crescent beaches offer leisure. 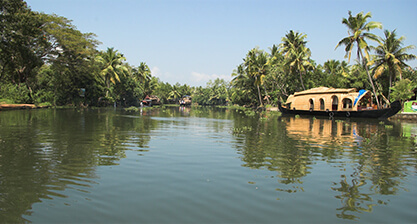 Alleppey, as it is known in Malayalam, is situated in “God's Own Country”, Kerala and was also called “The Venice of the East” by Marco Polo. 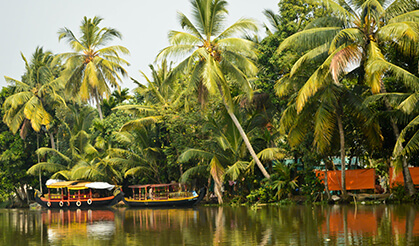 Shaded by coconut trees, this laid back little town is a beautiful collection of canals, backwaters, beaches and lagoons and has become a very popular Indian travel destination. It's easy to get around Alleppey on foot and one can come across many interesting old trading houses along the canals while taking a relaxed stroll down the quiet little streets, enjoying the relaxed pace of village life. Kottayam is a city in the southern Indian state of Kerala. It is located in central Kerala and is also the administrative capital of the Kottayam district. Bordered by the lofty and mighty Western Ghats on the east and the Vembanad Lake and paddy fields of Kuttanad on the west, Kottayam is a land of unique characteristics. The city owes its name to Lord Shiva, the presiding deity of the city. In the political history of South India, Thrissur has played a key role many times. A number of dynasties, which had ruled sizeable portions of Kerala and South India, had their capital here. 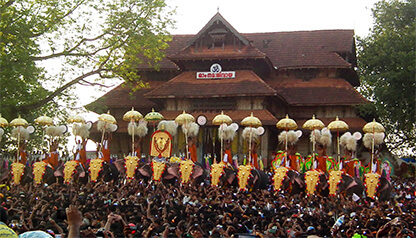 In fact, it is considered to be the cultural capital of Kerala. Glorious history and cultural richness have endowed the region with a rare charm. With its elaborate traditional music, dances, and spectacular festivals, the land embodies the very soul of Kerala. 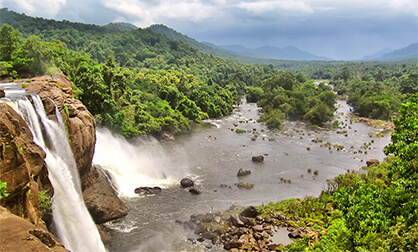 Athirapally and Vazhachal falls are located just five kilometres apart, on the edge of the Sholayar forest ranges. The Athirapally falls join the Chalakudy river after plummeting down 80 feet. The cool spray that covers a large area near the falls makes Athirapally a scenic location. The picturesque Vazhachal waterfall is close to dense green forests and is also a part of the Chalakudy river.